Slip and fall accidents can happen anywhere. The Slip and fall accidents Lawyers at Lucas Law, PLLC, in the Lakes Region of New Hampshire, are seasoned in settling to the benefit of their clients slip and fall accidents out of court and in successfully bringing them to trial. A slip and fall accident can happen at someone’s home, at a place or business, or in a public area. As it is with other personal injury cases, slip and fall accidents often include numerous defendants. 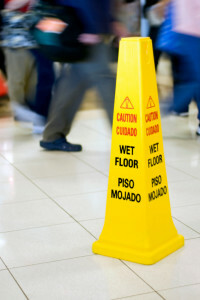 The fact is slip and fall accidents can result in everything from minor injuries to death. Such accidents include a person falling down improperly lit steps; someone being injured on a job site that does not include proper safety precautions such as restraining railings; and someone tripping over an improperly set up display in a store. In North America, slip and fall accidents are the second-leading cause of disability and accidental deaths. There are over 20,000 fatalities per year and the cost for expenses related to the care and recovery of victims is $32 million dollars a day. The victims of slip and fall accidents will often lose wages, have expensive medical bills, and may suffer permanent physical damage, Emotional problems, permanent scaring, and loss of physical abilities and motor skills may also be the result. Head injuries can be especially devastating. Someone is negligent in a slip and fall accident when they are responsible for the property, know of a hazard, and do not alert those entering onto the property of such hazard and/or they do not attempt to correct the hazard in a timely manner. If you are injured in a slip and fall accident, you must have taken reasonable precautions when confronted with a hazardous situation. If you did not use proper caution, then you may be found to be responsible for your own injuries. Someone is responsible if they are the owner of the property or an employee of that owner and they were the cause of the situation that resulted in the fall. Someone is liable if they are the owner of the property or an employee and they knew about the dangerous situation and did not try to remedy the hazardous situation. A person who is the owner or the owner’s employee is responsible if they should have been aware of the problem as a “reasonable person” would have been and that person would have remedied the danger or the circumstances. the “reasonable person” guideline. This makes proving fault difficult in these types of mishaps. If you are the victim of a slip and fall accident, contact the successful slip and fall attorney NH at Lucas Law, PLLC. Our legal team will work passionately and aggressively to make sure that your case is thoroughly investigated, all valuable evidence collected, and your case clearly presented. Our team will work hard to get you the best possible result and the compensation that you deserve. For more information on slip and fall accidents, contact the personal injury attorneys at Lucas Law, PLLC, in the Lakes Region of New Hampshire, at (603) 581-7102. We will discuss your situation with you, analyze the details of your case and offer you possible options that you may want to pursue. If you’ve been injured in a slip and fall, make sure that get the help that you need.